The Jews of Georgia are divided into two groups. Georgian Jews have a 2,600-year history in the region, while the Ashkenazim came to the country during the Russian annexation in the early 19th century. Today, there are approximately 3,000 Jews living in Georgia. Georgian-speaking Jewry is one of the oldest surviving Diaspora Jewish communities. The origin of Georgian Jews, also known as Gurjim or Ebraeli, is debated, but some claim they are descendants of the ten tribes exiled by Shalmaneser. Others say the first Jews made their way to southern Georgia after Nebuchadnezzar conquered Jerusalem in 586 B.C.E. after first fleeing to Babylonia. The first Jews in Western Georgia arrived in the 6th century when the region was ruled by the Byzantine Empire. Approximately 3,000 of these Jews then fled to Eastern Georgia, controlled by the Persians, to escape severe persecution by the Byzantines. The existence of the Jews in these regions during this period is supported by archaeological evidence showing that Jews lived in Mtzheta, the ancient capital of the East Georgian state of Kartli. The Ebraeli spoke Georgian and Jewish traders developed a dialect called Qivruli, or Judeo-Georgian, which included a number of Hebrew words. In the second half of the 7th century, the Muslim Empire conquered extensive Georgian territory, which became an Arab caliph province. Arab emirs ruled the majority of the region until 1122. Under the Arabs, in the late 9th century, Abu-Imran Musa al-Za'farani (later known as Abu-Imran al-Tiflisi) founded a Jewish sect called the Tiflis Sect which lasted for more than 300 years. The sect deviated from halakhah in its marriage and kashrut customs. The Mongols swept through Georgia in 1236, prompting many of the Jews of Eastern and Southern Georgia to move to the western region, which remained independent. There they formed small, poverty-stricken communities along the Black Sea, and eventually their destitution forced them into serfdom. For 500 years, beginning in the end of the 14th century, the Jews of Georgia belonged to the kamani, or serf class, under the Georgian elite. Their situation worsened in the 15th and 16th centuries due to constant military conflicts and invasions by Timur, Turkey, and Persia. By the end of the 15th century, Georgia had fragmented into three separate kingdoms and five feudal territories. Jewish serfs were sold from master to master as a family or individuals as debt payments or gifts. The Jewish communities were torn apart and Jewish communal life was nearly impossible to maintain. Isolation and lack of a religious and spiritual center led to a decline of Jewish knowledge. An endless string of wars and rebellions characterized the late 18th and early 19th centuries, leaving the region decimated. Jewish property was often confiscated and Jews were forced to seek the protection of the local feudal lords. Instead of finding security, many Jews became enslaved by these lords. Jewish serfs were divided into three categories according to Georgian law: the King's serfs, Feudal serfs, and the Church's serfs. During this period, large migrations of Jews took place, either voluntary or forced. In the 15th and 16th centuries, a large number of Jews left for Crimea, and Jews in the region can still be traced to their Georgian origins to this day. In the 17th and 18th centuries, tens of thousands of Jewish and non-Jewish Georgians were forcibly relocated to Persia by their Persian invaders. In 1801, the Russian Empire annexed Eastern Georgia. The King's serfs became the treasury's serfs, and were now obligated to pay taxes to the Tsar. In 1864-71, the Russian authorities abolished serfdom, and Jewish former serfs moved to towns and villages where free Jews were already settled. Finally, the Jews of Georgia began to develop a Jewish community. Each group moved together to the same towns and established their own respective synagogues. They were usually made up of a number of extended family groups spanning three or four generations. Each community had a gabbai who served as a rabbi, shohet, mohel, and heder, and oversaw religious and communal affairs. These small communities developed into the Jewish quarter of their particular towns. Anti-Semitism was a serious problem in Georgia, especially in the second half of the 19th century. Induced by Tsarist officials and the Russian Orthodox Church, anti-Semitism was supplemented by the end of serfdom and the urbanization of the Jewish population. Now traders instead of field hands, Jews became a threat to Georgian workers. Anti-Semitism had been an issue in Russia for centuries and, under the annexation, had begun to influence non-Jews in Georgia who, furious at being occupied by Tsarist Russia, took out their anger and xenophobia on the only other outsider: the Jews. Six blood libels took place in Georgia in 1852, 1878, 1881, 1882, 1883, and 1884. The worst and most infamous case was in the village of Sachkhere in 1878, when nine Jews were accused of partaking in the ritual killing of a Christian child to use the blood to make matzah for Passover. The highly publicized trial occurred in Kutaisi, and was called the Kutaisi Trial. The accused were found not guilty, but the blood libels continued. While the government had previously been relatively accepting of the Jews, after the revolution of 1905, the Russians took a harsher stance. Georgian Jews separated themselves from Russian Jews, emphasizing their loyalty to the monarchy and their roots in the region. In 1913, the deputy governor of Kutaisi extorted money from the city's Jews, and those who did not comply were murdered. After the October 1917 Russian Revolution threw out the Tsar's government and replaced it with the Bolsheviks, Georgia clamored for independence from their occupiers. On May 26, 1918, the Georgian Republic declared its independence. With independence came freedom of speech, press, and organization, which improved the economic situation of the Jews of Georgia. This newfound freedom did not last long. The Red Army invaded Georgia in February 1921, prompting a mass exodus from the region. Approximately 1,500-2,000 Jews left Georgia, 1,000-1,200 of whom settled in Palestine. The remainder fled mainly to Istanbul, where a Georgian Jewish community had been in existence since the 1880s. Initially, the Soviets allowed the Jews to maintain their religious customs, but after a Georgian rebellion in 1924, the government terminated all Zionist activity, imposed economic restrictions, and generally discriminated against the Jewish community. As a result, many Jewish businesses were bankrupted and 200 families applied for exit visas. Only 18 were allowed to emigrate. In the mid-1920s, the Soviets focused on industrializing and secularizing the Jews of Georgia. Mass numbers of Jews were forced to work in factories or to join craft cooperatives and collective farm projects. In 1927-1928, OZET, the organization for settling Jewish workers on farms, established a number of Jewish collective farms. These small homogeneous communities became isolated Jewish communities where Jewish learning was continued. Recognizing this, the Communists disbanded the communities in the 1930s, scattering the Jews among various farms and destroying Jewish communal life. Due to Soviet persecution and the declining economic situation, Zionist leaders focused on increasing aliyah efforts. The Soviets firmly opposed Jewish immigration and, during the 1930s, cracked down on Zionist organizations, arresting or murdering many members. In 1937-38, the authorities stifled participation in Jewish religious services or cultural activities. In September 1937, nine hakhams, two of whom were Ashkenazi, were arrested in Tzkhinvali (Staliniri at the time), and sent to prison without trial and murdered. During World War I, thousands of Georgian Jews served in the Soviet Army. After the war, the authorities arrested Jews and closed or destroyed synagogues, and anti-Semitic acts of violence erupted. But despite their attempts, the Soviets could not completely annihilate the practice of Judaism and, even in the late 1960s and 70s, most Georgian Jews managed to observe their traditions. Throughout Soviet rule, Jews remained society's scapegoat. They made up the majority of Georgians convicted for economic crimes, and were punished more severely than the rest of the population. Blood libels continued with incidents in Tzkhaltubo in 1963, Zestafoni in 1964, and Kutaisi in 1965. After the Six Day War, huge numbers of Georgian Jews applied for exit visas to immigrate to Israel. In August 1969, seventeen families wrote to the Human Rights Commission of the United Nations demanding permission to make aliyah. This was the first public insistence by Soviet Jews for immigration to Israel. As a result, the Israeli government and the Jewish world campaigned heavily on behalf of the plight of the Georgian Jews. 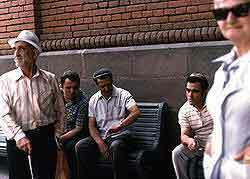 In July 1971, a group of Georgian Jews went on a hunger strike outside a Moscow post office. The determination of the Jews of Georgia led the Soviets to lessen their harsh anti-Jewish policies. Photo: Dr. Morris Plust, USA. During the 1970s, about 30,000 Georgian Jews made aliyah and thousands of others left for other countries. Approximately 17 percent of the Soviet Jewish population emigrated at this time. In 1979, the Jewish population in Georgia was 28,300 and, by 1989, it had decreased to 24,800. After the fall of the Soviet Union, Georgia declared her independence in 1991, and became a Commonwealth of Independent States (CIS) republic. Since independence, the country has faced continuous military conflict, leaving the region in political and economic turmoil. In 1990, the Rachamim Society was established, which supplies financial and medical support to the Jews of Tbilisi and maintains Jewish cemeteries and synagogues. It functions as an umbrella organization for Ashkenazi Jews. The Association of Georgian Jews (Derekh Yehudi) focuses on regaining Jewish property confiscated during the Soviet era. The Jewish community still faces acts of violence and obstacles in the return of property rights to a 19th century Ashkenazi synagogue stolen by the Soviets. The Chief Rabbi of Georgia is Rabbi Ariel Levin. There is no umbrella organization for all Jews in Georgia, but more than 30 Jewish institutions are in existence, in addition to one Jewish day school and four supplementary schools. Three Jewish newspapers are published-Menora, Shalom, and 26 Century, and there is also a Jewish radio and television station. The Jewish population of Georgia has steadily decreased over the years due to aliyah in response to the political and economic issues since independence. Overall, since 1989, 21,134 Jews have moved to Israel. Once numbering as many as 100,000, today the Georgian Jewish population is approximately 13,000. Tbilisi has the largest Jewish population at 11,000 out of 1.5 million. Jewish communities are located in Tbilisi, Kutaisi, Batumi, Oni, Achaltische, Ahalkalaki, Surami, Kareli, and Stalin's hometown of Gori, and synagogues are located in most of these cities. The provinces of Abkhazia and South Ossetia are virtually void of Jews due to the military conflicts in these areas. In January 2001, in a first step toward establishing relations, the Georgian Orthodox Church and the Jewish community of Georgia signed a cooperation agreement of mutual respect and support. In 2002, Georgian Orthodox Christianity was established as the state religion, and since then there has been concern for all religious minorities in the country. Relations between Georgia and Israel are warm. The Israeli embassy is located in Tbilisi and also serves Armenia;the Georgian embassy is in Tel Aviv. Israel has supplied humanitarian aid to Georgia a number of times, including drought assistance and aid for earthquake victims. Georgian President Giorgi Margvelashvilli visited Israel for the first time in October 2015, stating that it had long been a dream of his to come to Israel. Margvelashvilli and Israeli President Reuven Rivlin discussed future cooperation in start-ups, agriculture, real estate, and tourism. The Jewish Agency for Israel (JAFI) and American Jewish Joint Distribution Committee (JDC) both have permanent representatives in Georgia. JDC and Hesed Eliyahu distribute food and medical aid to the Jewish elderly, who make up more than 50 percent of the Georgian Jewish community. The numbers of Georgian citizens travelling to Israel and applying for asylum has skyrocketed over the past few years; only four Georgians sought asylum in Israel during the entirety of 2013, compared to 5,505 between January and November 2016. Jews, Tbilisi, Georgia (Gruzia) SSR, 1976.